The cryptocurrency rally from back in early February continues. So far, 2019 is turning out to be a good year for investing in the space. Leading April’s positive march was Bitcoin, shooting up from around $4,100 to more than $5,300. Since then, Bitcoin has been moving around the $5,200 price level. But it wasn’t only Bitcoin. Since April first, Litecoin (LTC) is also marking notable gains of a little bit less than 50 percent. Bitcoin Cash (BCH) is perhaps one of the strongest performers in the top 20 significant cryptocurrencies, gaining around 80 percent since the beginning of the month. The momentum of the market, however, is seemingly waiting for a sign from Bitcoin, which appears to be at a decision point. A rise from here is likely to cause the altcoin season party to continue with full force. However, the high volatility is also raising doubts in traders, causing them to question whether or not the prolonged bear market is over. Meanwhile, another interesting phenomenon was spotted. Major Bitcoin holders in the US tend to migrate to countries with lower taxes, as well as no restrictions on cryptocurrency-related services. Our Weekly Trading Tip: We would like to remind all traders that a cryptocurrency exchange is not a wallet and if you don’t have control over your crypto, you don’t own it. Before you buy any cryptocurrency, you should make sure that you have checked and looked for supporting wallets. The best option is a hardware wallet. Security and safety measures need to be in place to prevent any loss of your cryptocurrency holdings. New Hope For Tokenized Crypto Projects? The SEC Releases its New Guidance for Digital Assets. Hopes for further regulatory clarity sparked as the U.S. Securities and Exchange Commission (SEC) released a cryptocurrency framework, providing staff guidance on which coins fall under the classification for securities. While there’s still a lot of work to be done, the document does shed some of the ambiguity away. 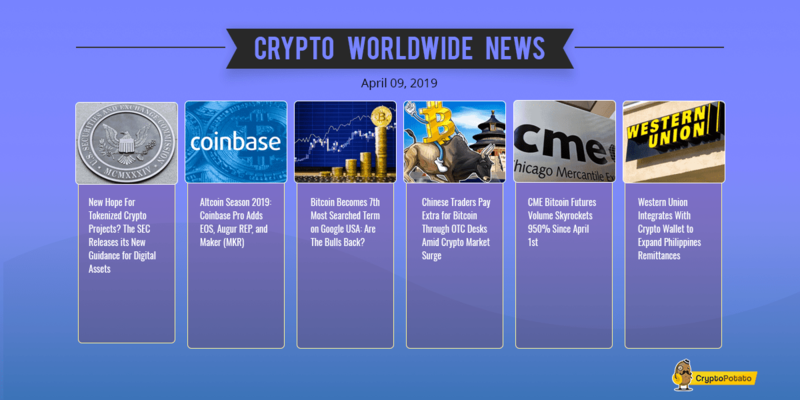 Altcoin Season 2019: Coinbase Pro Adds EOS, Augur REP, and Maker (MKR). As springtime blossoms, so does 2019’s Altcoin season. The leading US-based cryptocurrency exchange Coinbase added support for EOS, Augur (REP), and Maker (MKR) to its Coinbase Pro trading platform. Location restrictions apply. Bitcoin Becomes 7th Most Searched Term on Google USA: Are The Bulls Back? Bitcoin went through a massive rally, gaining upwards of 20 percent in a couple of days following April 2nd. As the price surged, so did the public interest. Bitcoin became the 7th most searched term on Google USA. Chinese Traders Pay Extra for Bitcoin Through OTC Desks Amid Crypto Market Surge. As Bitcoin advanced by more than $1,000 last week, interest amid Chinese traders followed. Moreover, reports have it that they are happily paying a premium for buying Bitcoin through OTC desks because they have to use Tether (USDT), which is more expensive than the USD. CME Bitcoin Futures Volume Skyrockets 950% Since April 1st. Bitcoin’s buoyant price caused yet another interesting phenomenon. Leading derivatives marketplace CME Group saw a spike upwards of 950% in the number of Bitcoin Futures Contracts since April 1st. This marks the daily all-time high contracts trading on the platform. Western Union Integrates With Crypto Wallet to Expand Philippines Remittances. In a push to facilitate remittances in the Philippines, money transfer giant Western Union teamed up with a blockchain startup Con.ph to allow international and domestic payments made via its network to arrive directly into users’ digital wallets. This week we have a chart analysis of Bitcoin, Ethereum, Ripple, BitTorrent and 0x – Read more here.